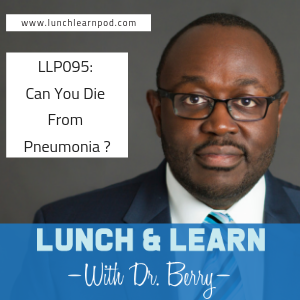 On this week's episode of the Lunch and Learn with Dr. Berry we are going to discuss the topic of Pneumonia. A topic that has gotten a lot of publicity of late as news that Kim Porter's , former model, actor and ex-wife of Sean “Diddy” Combs death was ruled due to natural causes from Pneumonia. What was interesting to me was the social media reaction that someone so young could die from something like pneumonia. Not very often you see one of the top ten causes of death worldwide being reduced to such a small stature but there it was so I decided to bring this episode to you front and center and maybe get a little appreciation of how deadly pneumonia can be. How can Pneumonia kill you? What are the causes of death from Pneumonia? How long can you live with Pneumonia? What are some interesting facts about Pneumonia? Is there a way to prevent Pneumonia?